You dream of having your own homestead but maybe you lack the time and resources to do it right now. Maybe you’re stuck in an apartment or are drowning in debt. We’ve been there! Here are three key ways we’ve changed our thinking that have allowed us to go from broke in the city to building our dream home with our own hands. “I don’t feel like a real homesteader because I’m stuck in an apartment, but I love to preserve my own food and make my own things. Years ago, I used to pore through my Mother Earth News magazines sitting in my little mid-century ranch. Surrounded by my fellow suburbanites, I dreamed of one day being able to have enough land that I couldn’t see my neighbors and being able to build a house of our own. I dreamed of getting back to our rural roots. I dreamed of having my own hiking trails. I dreamed of my future kids being able to run around the woods and make up adventures. I dreamed of being able to say that we built something extraordinary together. Five short years ago, we were up to our eyeballs in debt. Four years ago we started kicking it to the curb. Three years ago we paid it off for good. Two years ago we finally got up the nerve to sell our house and look for land. One year ago we sold our house and actually BOUGHT our land. And now we’re actually living those dreams we said we would. I’ll freely admit that five years ago I thought Mark was insane when he said we could build a house with our own hands. Heck, I barely had any experience! I thought we’d probably be in our little ranch by the highway forever. Never in a million years did I think we would be building a cordwood house and that I’d be blogging about it to all of you. I never dreamed I would get emails from strangers across the world asking questions and telling us they enjoy reading about the journey because they want to do it too someday. How did we go from dreaming to doing? To me now, it sounds completely crazy to say that we went from $24K in debt in suburbia to building an off-grid house debt-free, but it was anything but an overnight change. I could say that it all started when we got out of debt, but that would be missing the real underlying principles that have sustained us through everything. Even on our .2 acre postage stamp in the city, we had “homesteading” hearts. We strived to grow and hunt our own food, to make our own cleaners, and to get rid of the excess “stuff” in our lives. I’m sure that many of you have that “homesteading” heart right now and either lack the means to get the homestead of your dreams or lack the knowledge of what to do first. But like I said before, it isn’t an overnight change. It may take you a while, but if you have the vision of what you want your life to be and the drive to get there, you can make those incremental changes just like we did and achieve your dreams. 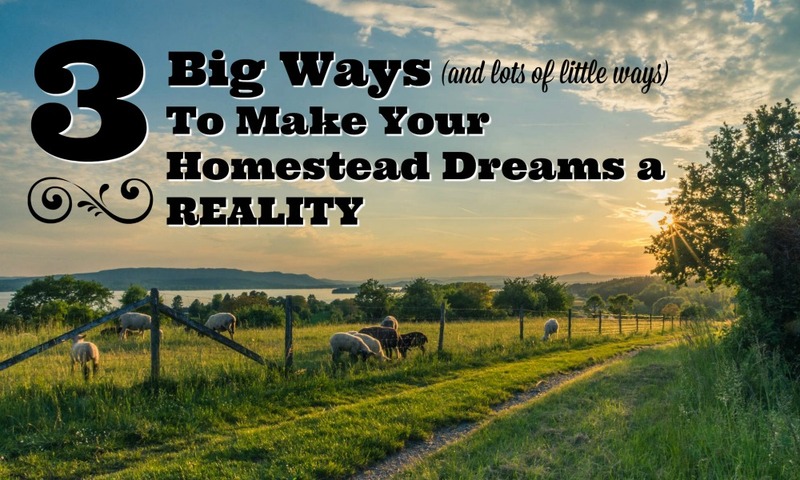 How can you make your homesteading dreams a reality? 1. Take real measurable steps towards a piece of your vision. Do you want to build a house without a contractor like us? A real action could be to call your local building inspector, or to buy books with the information you need and then actually read them. Do you want to grow your own food? Take a class on gardening from your local cooperative extension office, read a book, read blogs or take an e-course. Create a budget and/or financial action plan. Make a list of everything you would LOVE in your perfect homestead. Write out your ultimate goals for living a more self-sufficient lifestyle. If you have the drive to make your vision a reality, you can accomplish it. If you don’t, you won’t. Simple. And if you lack the drive, perhaps you need to re-evaluate your vision. Make sure that it is what you actually want and not what you think you’re “supposed” to do. If you need some guidance, feel free to download this free goal-setting and budgeting worksheet. It’s a more elegant version of how we wrote out our goals and objectives and then aligned our spending to meet them. 2. Be persistent, but also appreciate where you are. If you have a homesteading heart, there is so much you can do where you are with what you have. If your dream is to own land one day, but you currently lack the money to make it happen, don’t let impatience set you up for failure. Get your financial house in order and do whatever sustainable things you can in the meantime. Take the time to learn a new skill like sewing, canning, gardening, knitting/crocheting, soapmaking, cooking, etc. It may be that the only thing you can do right now is to use reusable grocery bags or container garden. So be it. Every day that you keep after it is a day closer to reaching your goal. 3. Recognize that the journey is more important than the destination. I think “homesteading” gets romanticized and the reality is much more gritty. There is so much more for us to learn as we develop our land. Some days, I don’t feel like a “real” homesteader because I see how much we still don’t do. Some days it feels silly because raising chickens, tending the garden, and canning the harvest is just what people DO around here where we live; I’m not sure many of them would even think to CALL it “homesteading”. It’s easy to feel like “small potatoes” by comparison, but comparison is the thief of joy. Sure, I’ve never raised chickens. I haven’t gotten to can my own food yet, nor have I gotten to do some of the basic “homestead” things I always see other people doing. That can’t negate all of the amazing things I’ve gotten to learn and do over the past year and a half. There is so much more to learn and we’re just getting started! I still can’t believe we’re actually getting to do this. Most people never take their dreams beyond their own imaginations. The fact that we are taking actionable steps to live our dreams is miraculous and terrifying, but we aren’t any different from you. There’s nothing earth-shattering about us that sets us apart from any of you reading this right now. Surely you have hopes and dreams for how you’d like to live your life and fulfill your purpose on this Earth. Today, I feel like my purpose is to let you, dear reader, know that you are not alone, and you can do this. We were once those people saying, “I’m stuck where I am and feel like I’ll never get there,” but the possibilities are limitless! It may not be today that you go get your homesteading land. Heck, it might not be tomorrow, next week, or even next year. It may not take the form you see in your head, but you’ll get there if you have the vision and drive. And if for some reason you don’t, at least be able to say you were trying. In the meantime, homesteading isn’t just a practice, but a state of mind. Do what you can where you can. Don’t feel like you have to fit a certain mold or reach an ideal standard. Even if you do get your land, it’s impossible to make yourself fit this perfect image in your head. Don’t. Just be you, do what you can, and most of all, KEEP DREAMING.